With the Outlander XL (Extra Long) Exterior Lift by Pride you have options. You can order the lift with lock-down arms that are specifically designed to help secure scooters, or with ratcheting straps that are made for power chairs or scooters. The Pride Outlander XL isn't your typical lift. Due to its extra long base it can carry large scooters and lift up to 380 pounds. We understand that our customers are always looking for value, so we include a battery pack as standard. Now you can forget about all that difficult wiring and enjoy the convenience of this lift. 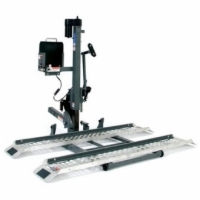 Other features include a license plate holder, adjustable wheel chocks and the manual override feature.